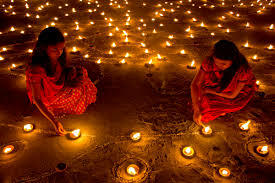 Diwali is the most important Hindu biggest festivals of India, the festival is celebrated across India for five days, with the main celebrated on the third day. Houses are cleaned and decorated with fancy lights candles and clay lamps. People purchase new clothes for them and their family members, participate in family puja, and the main celebration of Diwali festival burst crackers, and share sweets with families, friends, and neighbors. Festival is celebrated in the victory of Lord Rama over Ravana. It is believed that Lord Rama came back with along with his wife Sita and brother Lakshmana, after 14 years of long exile.